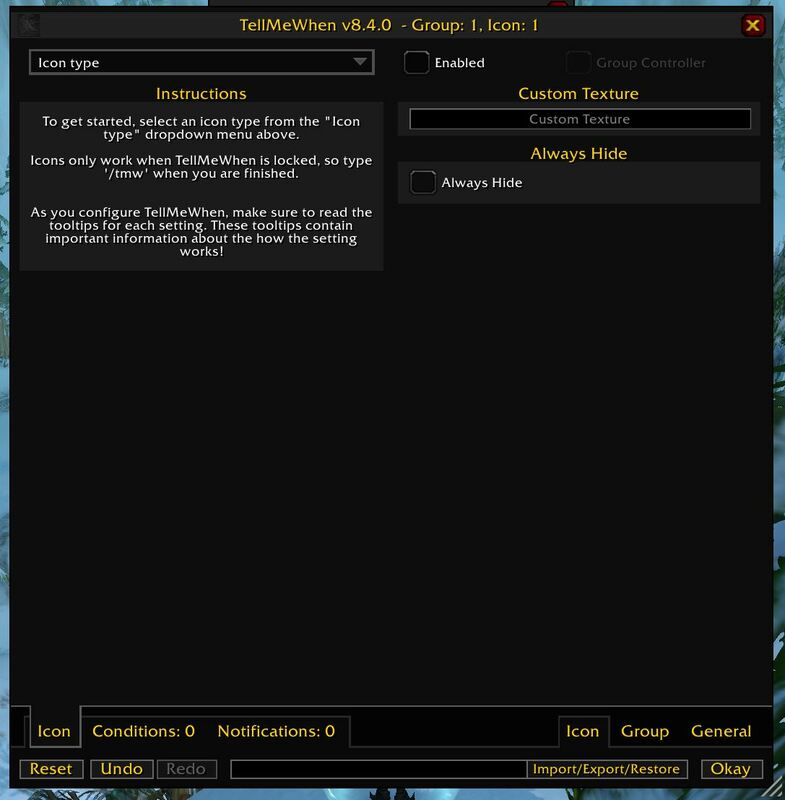 Why are we requiring TellMeWhen | Basic TellMeWhen setup | Installing Data from Players | Clicking on images will open a larger image in a new tab. When we raid as a guild we are always on the lookout for an addon that can help us make encounters easier or help call out one ability that people may have trouble with. 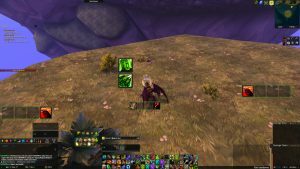 Looking at Tomb of Sargeras (ToS) and watching the guide videos it is clear that some fights are going to need more from players than what we have become use to in normal mode. 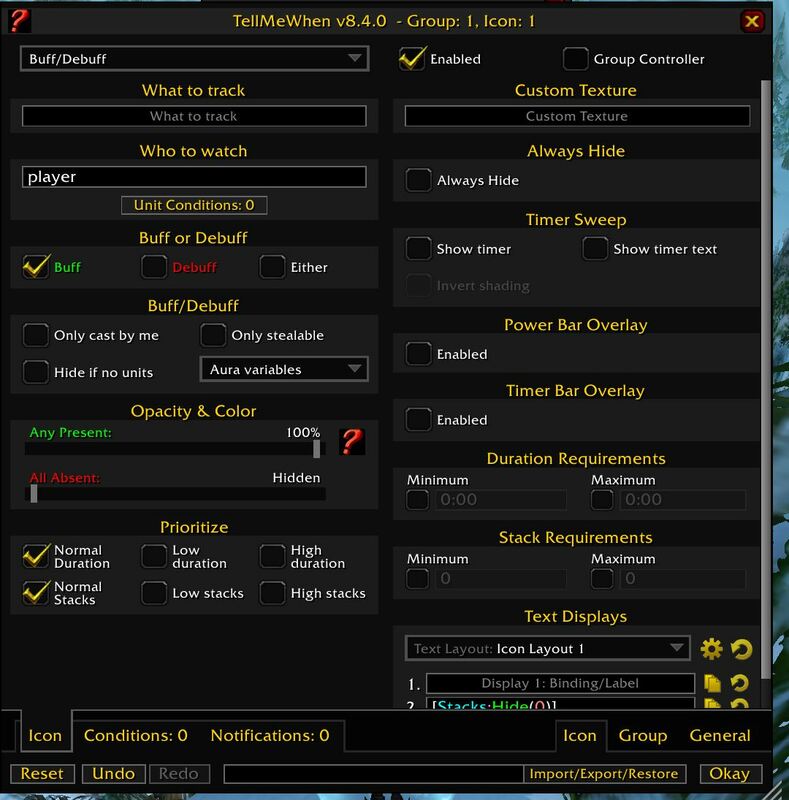 To battle that we are adding an addon called TellMeWhen to the required raiding addons. 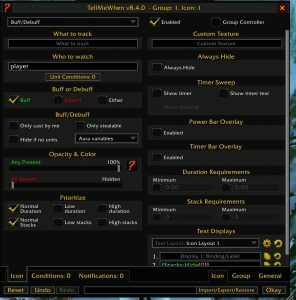 “TellMeWhen provides visual, auditory, and textual notification about cooldowns, buffs, and pretty much every other element of combat.” – Source Addon Page On Curse. 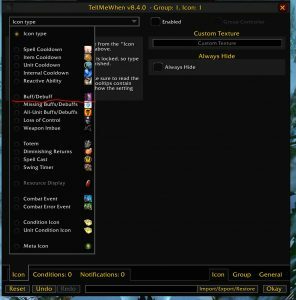 With this addon once you assign buffs or debuffs or anything you wish to track you can put the location it/they will shows up anyplace on your screen. You can even have it right next to your character if you wish. As we go through ToS when the raid leaders feel it needed they can make a group on the fly for fights and share it with the raid and then everyone has it. After a very simple import process. 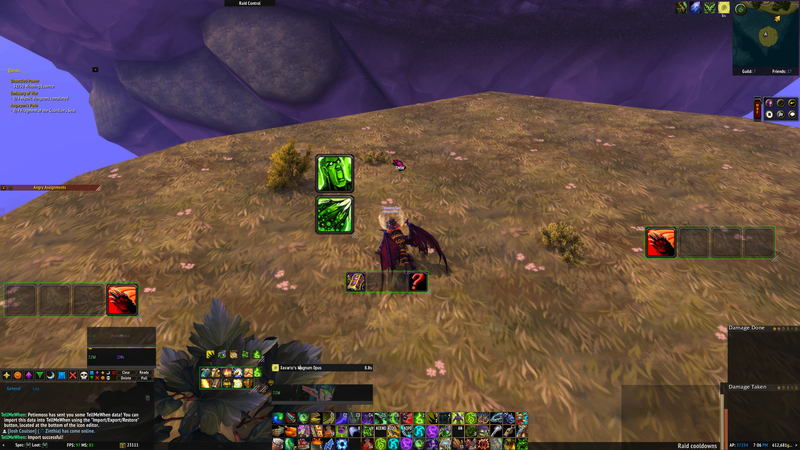 The boss that made us start looking for some addon to assist everyone was Maiden of Vigilance. This is a boss we haven’t seen in normal mode raiding having ability’s that all it takes is one person missing the debuff can cause a raid wipe. We will have both a text guide and a video on how to use TMW. The text guide will come first. 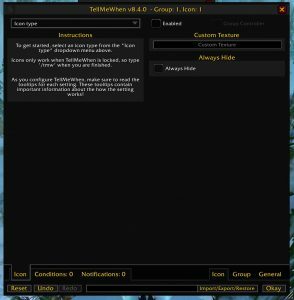 We already have people in the guild using TellMeWhen. On all my tanking classes I use to track large Def cooldowns. On the Demon Hunter it is used to track Soul Fragments and on the Death Knight it is used to track both the time and stacks of Bone Shield. Uses it to track buffs and debuffs that are put on the target. 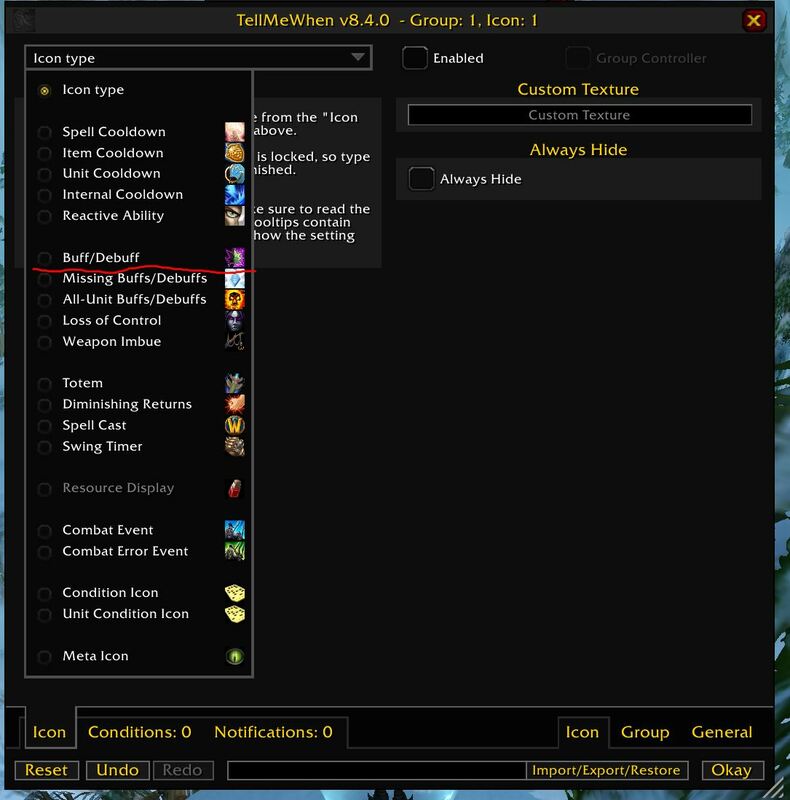 One of the buffs tracked is when Concordance of Legionfall is up. Uses it to tack ability’s on many different classes. Ret Pally it is used for tracking judgment on targets. Arms warrior it is used to track Colossal Smash. Fury Warrior it is used to track the 4 sec enrage buff. 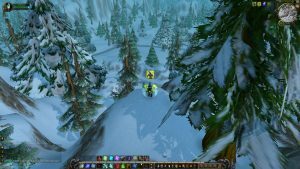 Fury was a spec found very difficult to play without the addon TellMeWhen. Uses it to track healing cooldowns. Uses it to track trinket cooldowns. Please note that the spell being added this this example is a Vengeance Demon Hunter ability. If you are on a different class and want to do this use a spell from your class. Then just below that you see 4 light boxes. Now let’s make a button that shows up when I push Immolation Aura. We are going to right-click one of the 4 light boxes. From the drop down let’s select buff/debuff. 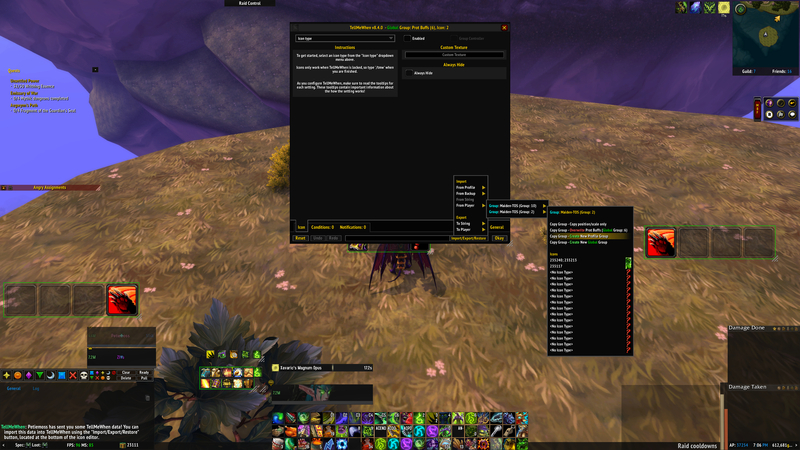 Now that we selected buff/debuff we have a new window with a lot of options. We need to start with “What to track” in the gray “What to track” box let’s type in Immolation Aura. If you look on the right hand side a box shows up when you start typing. You can finish typing or select it from that list. 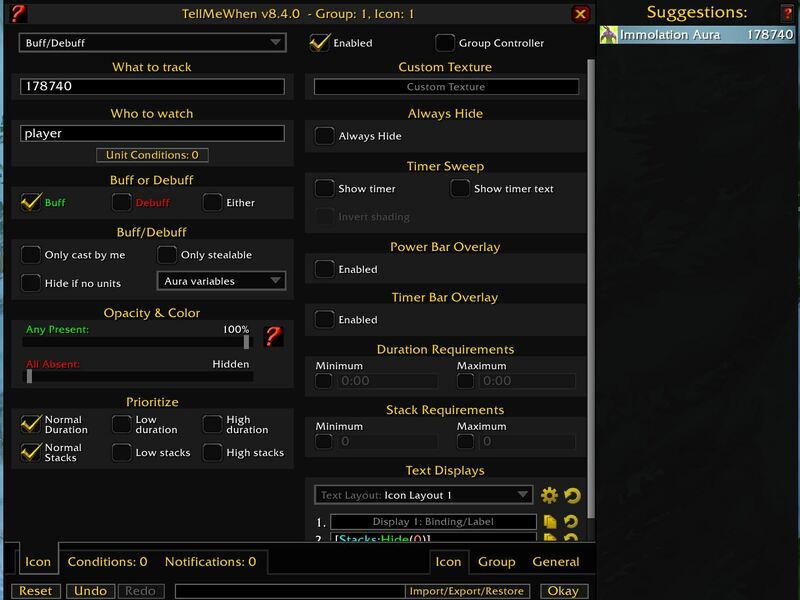 Or you can go to wowdb.com and get the spell ID and put it in. Under “Who to watch” it should say “player” if so leave it alone if it doesn’t put player in it. Then hit “Okay” in the lower right hand side. Now the box you right-clicked on should have the spell icon in it. Now we are going to click “Exit config mode” or do a /tmw This will hide all the empty boxes as well as the TellMeWhen box at the top. Now we are going to push Immolation Aura and hope it comes up on screen. Alright it did. Now anytime Immolation Aura is pushed it will show up on our screen. But let’s say we want to move the icon so it is above our character. To do this we do a /tmw and drag the group to any place you want on your screen. After we move it again do the “Exit config mode” or do a /tmw Now let’s push Immolation Aura and see if it shows up in the location we moved it to. That is the basic on how to get something into TMW. Now that you know the basic on how to set up TMW let’s look at how to import when a Player, Raid Leader, or Guild Member sends you TellMeWhen data. So let’s get this data from Petiemoss! 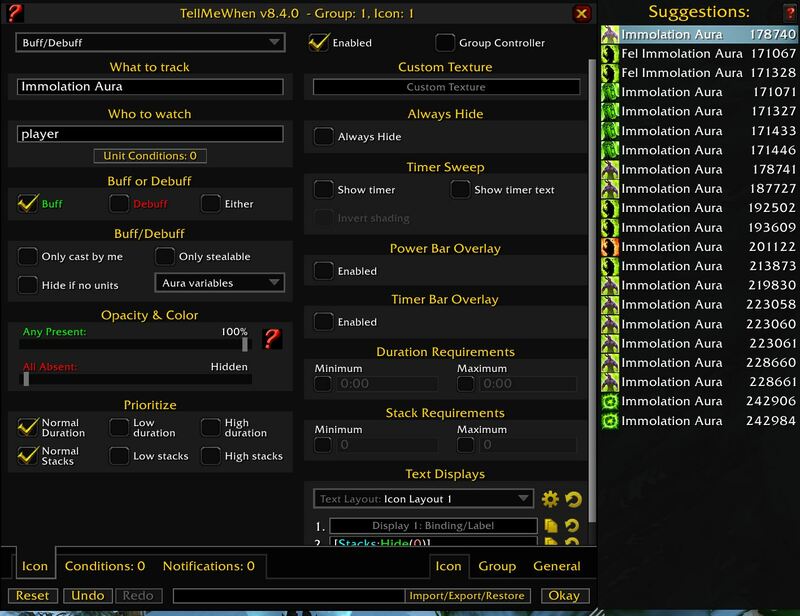 We are going to do /tmw and then right-click on one of the light boxes or any currently build icon. In the next box you are going to look in the lower right hand side for the “Import/Export/Restore” button. Once you import hit “Okay” and you will see the new group on the screen. You can move these around but if it is something a raid leader sent you have it some place on the screen that you will see it when it goes off. Once you move it do /tmw and you are good to go for the next pull! 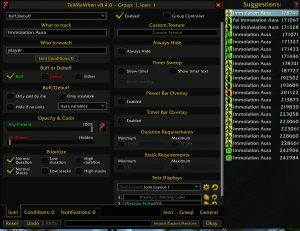 Please note that most of this the screen shots are taken from the PTR the last few are done on live as such you will see many extra TMW groups on my screen. The icons we are looking at here and the ones that got sent to me from Petiemoss are the two large green icons.